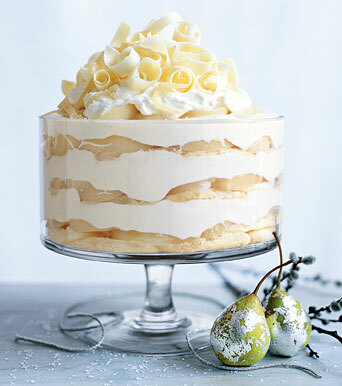 Kristine Kidd was the food editor at Bon Appetit in 2007 and early in the year she called me and asked me to make a “showstopping white Christmas dessert”. The idea was to evoke “white Christmas”. One of the many reasons I love writing for the magazine is that the assignments often push me in ways that I would not normally reach for myself. After being given the assignment, I was then expected to create a list of possible ideas within 24 to 48 hours. Kristine and the magazine’s editorial team would review the ideas and choose which one they wanted; this was determined on flavors and visuals as well as how well my recipe would go with the rest of the recipes being chosen for that month’s issue. Here were some of the rejected ideas: Crème Fraiche Vanilla Bean Meringue Torte; White Chocolate Birch Buche de Noel; White Chocolate Mint Boule de Neige; White Chocolate Rum Snowball; Il Flottante; Crème Fraiche Amaretto Cheesecake and a few others. Looking at the list now, I think I will re-visit some of these as they were not developed into full-fledged recipes at the time. If you have a preference, let me know and I will see what I can do! Once the recipe concept was chosen, then I had to figure out how to make it real! I hit the kitchen and started whipping up the components. I had poached the pears and saved the liquid and during the first attempt, when I got to the assembly part, I realized that the pear poaching liquid would be the perfect moistening and flavoring syrup for brushing on the ladyfingers. It hadn’t been planned – but there it was. It is not often that such a brilliant multi-usage for components happens within a recipe and I am thrilled with the results. Use a 12-cup clear glass trifle dish to best showcase the layers. Try to find pear juice that is 100% fruit juice with no extra sugar, if possible. (It’s often a mixture of fruit such as apple, pear etc.) Note that I mention a specific size pot for poaching the pears; this is the best size to keep the pears upright, although it is not necessary. Make sure to take advantage of all the do-ahead steps to make this as easy as possible. For Spiced Pears: In a deep, 6-quart (9 1/2-inch diameter, 5-inch deep pot) non-reactive pot, combine white wine, pear juice, sugar and spices; stir well, cover and bring to a simmer over medium-high heat. Add pears and simmer covered for about 30 to 35 minutes or until pears are just tender when pierced with a sharp knife. Cool pears in poaching liquid. You should have 3 cups of liquid. (This may be prepared the day before serving; refrigerate covered until needed). For Mousse: Melt white chocolate, pear brandy and water together in top of double boiler or in microwave. Stir until smooth; it will be liquidy. Scrape vanilla bean seeds into mixture and whisk to break them up and incorporate. Whisk in mascarpone. Allow to cool slightly. Whip cream until soft peaks form and fold into mascarpone mixture (if mascarpone mixture is still too liquidy, begin incorporating the cream by using a large balloon whisk, then finish off by folding with large spatula). Cover and refrigerate until firm, about 2 hours. (This may be prepared the day before serving). The chocolate should be one large block with a surface area at least 4-inches square. You will only use about half, but this size is easiest to work with. The chocolate needs to be very slightly warmed. You can hold it between your palms for a few minutes, or you can place it in microwave for 5 to 10 seconds at high power (depending on size of chocolate and strength of microwave). Place the chocolate on work- surface (I place it on a piece of parchment paper) and hold with one hand. Grasp the biscuit cutter firmly with the other hand and, beginning at the top of the piece of chocolate, hold the biscuit cutter nearly flat to the surface of the chocolate, ever so slightly angling it down near the top, applying pressure there (in this way, the top curve of the biscuit cutter is in contact with the chocolate). Firmly drag the cutter towards you. A curl should form and curl up over itself within the biscuit cutter. If the chocolate shatters, it is still too cold. If the chocolate is too soft, a curl will not form either. Adjust the temperature and make curl after curl until you have used about half of the chocolate. Gently place the curls as you make them onto a plate (I use a pie plate) in a single layer (see photo for shape and inspiration). (These can be made several days before serving and stored in airtight container at room temperature). For Assembly: Remove pears from poaching liquid and set aside. Bring liquid to a boil over medium-high heat and boil uncovered for about 10 minutes or until reduced by half (you begin with 3 cups and end up with 1 1/2 cups. You need a total of 1 1/4 cups; if you have less, add more pear juice to make up the deficit. The syrup should still be fluid and not so condensed that it is caramelized, which can happen if reduced too much). Strain and discard spices. Set liquid aside. Cut pears into 1/4-inch thick slices; discard stems and cores. Scrape mascarpone mousse into pastry bag fitted with large star tip. Arrange ladyfingers, rounded side down, in bottom of trifle bowl, covering entire bottom, some may be slightly overlapped (I use about 15 per layer). Brush with 1/4 cup of pear poaching liquid, saturating ladyfingers evenly. Pipe a layer of mousse, taking care to keep the sides neat and even with a single ring of piped mousse (I begin with the ring around the edge against the glass and continue in a concentric spiral toward the middle). Arrange pear slices on top of mousse nestling their curved edges neatly against sides of bowl; arrange them snuggly to make a single layer. Repeat ladyfinger, mousse and pear layer two more times. End with fourth layer of ladyfingers and brush with syrup (you may have a few ladyfingers left over). Whip 2 cups heavy cream until beginning to thicken. Add 1/4 cup poaching liquid and beat until soft peaks form. Using clean pastry bag and tip, pipe large rosettes of cream all over top of trifle. The trifle should be just about even with the top of the bowl at this point. Refrigerate at least 6 hours, or overnight. Right before serving, arrange white chocolate curls all over top of trifle, sprinkle with confectioner’s sugar (through a fine strainer) and finish off with a sprinkling of crystallized ginger, if desired.